President Obama Tuesday presented National medal of Arts and National Medal of Humanities to recipients in the East Room of the White House. Pictured in audience are honorees (from left to right) Rita Dove, Al Pacino, Emily Rauh Pulitzer, Martin Puryear and Mel Tillis. First Lady Michelle Obama and Second Lady Jill Biden also attended. President Obama paid tribute to Americans who have excelled in the arts and humanities when he awarded the 2011 National Medal of Arts and National Humanities Medal. Actor Al Pacino, country singer Mel Tillis and Rita Dove, the youngest person to be named U.S. youngest poet laureate, were among those honored in the White House East Room Monday. Quoting from the work of American poet Emily Dickinson, Mr. Obama told the artists and writers, "[W]hat connects every one of you is that you dwell in possibilities. You create new possibilities for all of us." 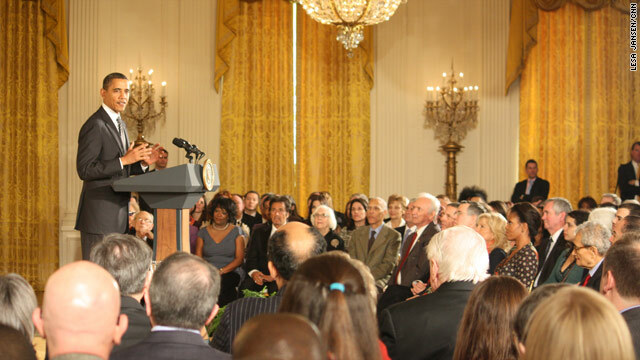 The president also stressed the importance of continued support of the arts for children in this country. "[A]s we honor the icons of today we also have to champion the icons of tomorrow. They need our support. We need them to succeed. We need them to succeed as much as we need engineers, scientists, we also need artists, scholars,” said President Obama. “We need them to take the mantle from you, to do their part to disrupt our views and to challenge our presumptions and, most of all, to steer in us a need to be our better selves."